Deputy Art Director Supriya Kalidas, an adventurous cook, faced her fears about baking and created a cobbler to die for. I am a fairly confident and somewhat adventurous cook, but a baker I am not. I like to improvise while cooking, and the need for a strict adherence to a recipe while baking terrifies me. I went without an oven for about 4 years, and I have never felt the need to own a stand mixer. Every tentative foray I have made into the world of baking has usually come to a screeching halt upon encountering (what ought to be) an illegal quantity of butter in the ingredients list. Why this recipe?When the theme for this round of the Cookbook Club was announced (Valentine’s Day Brunch), I knew that my labor of love needed to be more complex than eggs on toast. It was also the perfect opportunity for me to step out of my comfort zone. I had to bake something! I picked this particular recipe because neither my husband nor I have a big sweet tooth, and a savory dish with biscuits sounded like just the ticket. Also, tomatoes, thyme and goat cheese! What was it like to make it?The recipe is very easy to follow, and the dish was much simpler to put together than I had feared. I used a pastry blender to mix the biscuit dough because my hands run pretty warm, and I didn’t want the butter to melt and create a gooey mess. When you have to purchase special tools for a recipe, you know it’s serious business! My best intentions aside, however, the butter did melt during the last step while I had to work the dough with my hands. The dough had to spend an emergency 5 minutes in the freezer before it was ready to be cut into biscuits. The recipe made exactly 9 biscuits, as stated. The tomato-thyme mixture was easy to prepare, and left my kitchen looking and smelling like summer. Plus, the heirloom cherry tomatoes I used made for a pretty picture. I recently picked up a gorgeous cast iron skillet, and I was excited to take it out for a spin. The recipe requires that the frozen biscuits be brushed with an egg wash before baking. This helps the biscuits brown and acquire that shine that makes them look so delicious. Only one problem there: I had never separated an egg before. (In my defense, egg white omelets have never been the stuff of my dreams). Seven how-to videos on separating eggs later, I was ready to tackle this task. Success! How did it turn out?The cobbler looked and tasted wonderful. The biscuits browned beautifully, and the combination of the sweet tomatoes, earthy thyme, and the tart goat cheese was, as expected, divine. In retrospect, I would have used a finer grind of cornmeal instead of the one that I found in the bulk bins at Whole Foods. The coarse grit gave the biscuits a sandy texture that I found a bit unpleasant. And even though author Zoe Nathan says this isn’t a traditional deep-dish cobbler, I still would have liked a higher tomato-to-biscuit ratio. Will I make it again?Undoubtedly! I can’t wait to make this again in the summer when tomatoes are in season. The biscuits can be made ahead of time and stored in the freezer, so it would make for an quick weekend brunch. Also, it’s one recipe I now have in my baking arsenal that’s not a cookie! Press the dough into a disc ¾ in. (2 cm.) thick. Cut the dough into nine biscuits. Transfer to an ungreased sheet pan and freeze for 1 to 2 hours. Preheat your oven to 350°F/180°C. Brush the frozen biscuits with egg wash and arrange them, 1 in. (2.5 cm.) apart, on top of the tomato mixture in the skillet. Bake for 25 minutes. 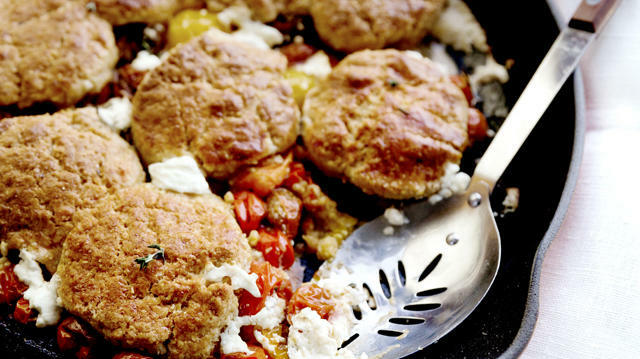 Remove briefly and quickly dollop the goat cheese between the biscuits over any exposed tomato. Return to the oven, increasing the temperature to 475°F/240°C, and continue baking until the top is nicely browned, about 10 minutes longer. Serve warm or at room temperature, topped with the remaining thyme. This is best eaten the day it’s made.